PROMASTER Professional umbrellas are one of the finest quality photographic umbrellas built today. 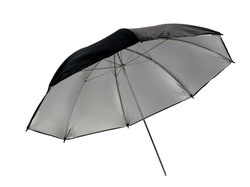 Umbrellas are used to diffuse light when using studio style flash heads. Some umbrellas are made with just a diffuser you can shoot through to diffuse the light, whilst others have a relective surface the the flash is fired into. Some combine the two by offering a removable scrim. Our professional umbrellas feature solid core frame construction for a lifetime of trouble free use. 8mm solid stainless main rod and solid core stainless or fiber spines are designed to prevent “crimping” and stand up to the demanding needs of professionals. These umbrellas all include a convenient storage/carrying case. Available in a variety of sizes and colours.